npm config get prefix takes incredibly long. I was chasing this issue in creationix/nvm#1261 where nvm was taking incredibly long to load, and then realised that it was just the npm config get prefix command that was responsible for 95%+ of the slowdown. Unfortunately, this is a new machine and this problem has been happening from the first time I installed npm using nvm. Fresh installs of nvm haven't changed anything, the slowdown is still there. I understand that the original issue was when using nvm, but since it was specifically the npm command that took extremely long, I came here to figure out why. If there is any further profiling or debugging to do, I would love to get to the bottom of this. Can you send in a time "npm config get prefix"? Also could you get the syscalls that are taking up that time? Another thing I forgot to mention is that this only happens the first time it is called. Basically the first time after boot, after which it's just a few hundred milliseconds for all successive calls. I'll reboot and get a time. Also, I can strace the command, but I'm not sure how to do a time-based profile of it. Any suggestions? Or should I run a profiler and see what function calls are made? I think I meant strace. Sorry for the confusion. ☹️ Also, it is really odd that it only happens on the first time. Do you have any strange config? user-agent = "npm/3.10.3 node/v6.7.0 linux x64"
; "npm config ls -l" to show all defaults. Any idea why this is happening @KenanY or @othiym23 or @zkat? fwiw, npm config get prefix is also the slowest part of http://nvm.sh, by a long shot - if there's a faster way that's equally reliable to get the prefix setting, i'd love to use that instead. @ljharb, if you look at the top, you will see that this issue was opened from @polybuildr investigating that issue in nvm. Another way to do it would be npm prefix -g, but that might not be faster. @legodude17 yes, if you look at the linked nvm issue, you'll see that i requested they file this very issue. npm prefix -g is an alternative i'll look into, thanks. Speaking of npm prefix -g, @polybuildr, can you try time npm config get prefix and time npm prefix -g? 🤔 I wonder why it hangs like that. Our startup process could use some work, and it generally looks like this is an occasional hiccup -- the bulk of the startup process is just reading config files and loading dependencies. Some of those are bigger than others and maybe not necessary, but this is worth taking a look at. 7+ seconds is kinda extreme. I'm not sure there is much to be gained by the comparison between npm config get prefix and npm -g prefix because even in just npm config get prefix I see variations between 5 seconds and 70 seconds. I'll run an strace on next boot. Ok. So npm prefix -g doesn't help much. The strace output will hopefully help. I'll run another strace with the absolute time printed and I'll also try ltrace later maybe, if that will help. I was considering if the bootstrap makes any HTTP-request, and I could see some of the potentials of that from the following codes, but the above log didn't suggest any slow HTTP-request. I have been looking into the nvm issue as well in order to figure out why the nvm is so slow to start. 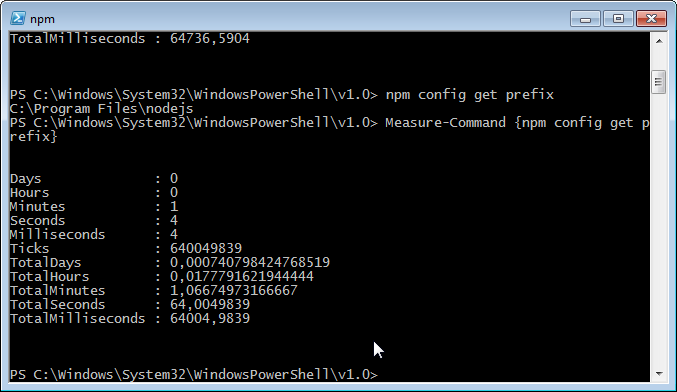 In my research I figured that npm is the slowest part of nvm. On my machine nvm takes almost 3 seconds to start up. I wrote some old-school tests for the performance and they showed that most operations are quick but for a few tasks it has to use npm which makes it slow. I updated the tests by running a hack version of npm config that excludes all the npm command line overhead and just loads the data. It seems like more than half of the time is spent on things other than "loading the config". Would be be reasonable to extract the lib/config code into a separate package that it turn could be improved for performance? There is a long term goal for npm to move into more smaller packages, but at this point you might just want to copy lib/config.js and most of the config folder into your own module and use that. On Mon, Dec 5, 2016 at 8:52 PM, Martin Heidegger ***@***. ***> wrote: Edit: I updated the tests <https://gist.github.com/martinheidegger/32d00e90e0163a22a4ffc78df796001e> by running a hack version of npm config <https://gist.github.com/martinheidegger/32d00e90e0163a22a4ffc78df796001e#file-npm_config_hack-sh> that excludes all the npm command line overhead and just loads the data. It seems like half of the time is spent on things other than "loading the config". Would be be reasonable to extract the lib/config code into a separate package that it turn could be improved for performance? — You are receiving this because you were mentioned. Reply to this email directly, view it on GitHub <#14458 (comment)>, or mute the thread <https://github.com/notifications/unsubscribe-auth/AKr56AZdUWzA4D0r4pBADJfFKq1L0ONPks5rFOnxgaJpZM4KjudD> . I would say "no", but I am not on the CLI team, so maybe ask @othiym23? It is not a high priority right now, but we've definitely been looking at what exactly is causing the slowdown, and it's a mixture of several things. Config itself isn't even half of it. The most noticeable thing is spending ~200ms on a single one of our dependencies (which, in the case of npm prefix -g is not necessary). But the way that stuff is factored right now makes it fairly tricky to lazy-load: not impossible, but one of us needs to spend Actual Time on it. The rest involves a long-term project to get rid of the massive global config-object in favor of something a bit more granular, but we really haven't gotten to the point of being able to design that yet. @ljharb I'd say to go and make that PR if it weren't a thing that required more serious architectural planning/design from the core team. I'm sure if a community member benchmarks the actual startup process and finds a minimal-impact way to cleanly and reliably lazy-load said dependencies and is willing to do a little bit of back-and-forth, we might look at a PR. But please don't do the whole thing with all the tests before talking about it with us, cause I can't guarantee we'd pull it in. That would be a nearly 50% speedup right there on startup. I am concerned, though, about why it spikes to 7-70 seconds, as I can't reproduce the particular thing that @polybuildr is mentioning. If we had benchmark information about where all that time is going, we might even be able to target a more specific bit, but my best guess right now is that it's just a disk access hiccup from having to do all the work of loading said Big Dep. I read the code in lib/config/find-prefix.js and found quite a few steps that could increase performance and those are actually logical overlaps with the Node.js code. I asked Node.js/help if & why the code is split and it seems that it would be possible to ask/propose an API to node.js to receive the prefix quicker. If npm wanted to use that, they should file an issue or pull request to make it public API. Would an API like: module.prefix be useful to NPM? We're closing this issue as it has gone thirty days without activity. In our experience if an issue has gone thirty days without any activity then it's unlikely to be addressed. In the case of bug reports, often the underlying issue will be addressed but finding related issues is quite difficult and often incomplete. If this was a bug report and it is still relevant then we encourage you to open it again as a new issue. If this was a feature request then you should feel free to open it again, or even better open a PR. This is causing huge slowdowns in nvm, so it'd be appreciated if this could be left open until it's addressed. Also you can very consistently reproduce this on Windows Subsystem for Linux (WSL) aka Bash on Windows. It happens literally every time on every shell invocation without fail. npm config get prefix is slightly slower but pretty comparable. So npm is simply loading a lot of stuff for this low-powered system to deal with (storage reads are slow). This looks better when system caches are primed, but it doesn't have a very powerful CPU either so we still spend about 3 seconds.